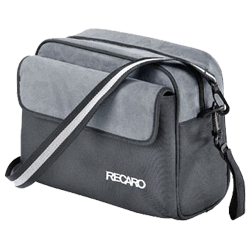 A stylish RECARO-branded messenger bag with two internal mesh pockets and water bottle holder, and two external pockets - one with a magnetic snap-fastener. The bag is the perfect size to hold an iPad, or a small netbook, as well as notepads, cameras, or anything else you need to keep to hand. The bag is lightly padded, and comes with a matching shoulder strap, and two velcro belt/handlebar straps. Click on the image to see an example of how much the bag can hold.